Yet another FDA Alert – this time on positive displacement needleless connectors – a device all nurses are very familiar with and use on a daily basis on patients requiring infusion therapy. The FDA has received three reports of death associated with BSI and positive displacement needleless connectors. Infection control authorities are also concerned about positive displacement connectors and the device’s association with BSI. As you may be aware, the Society for Healthcare Epidemiologists of America and Infectious Disease Society of America have recommended against using positive displacement needleless connectors with mechanical valves without a thorough assessment of risks and benefits (http://www.journals.uchicago.edu/doi/pdf/10.1086/591059). Additionally, there have been multiple clinical reports since 2006 showing an association between the introduction of positive displacement needleless connectors into a hospital or unit and an increased rate of BSI, followed by a reduction in BSI after changing to another type of needleless connector. 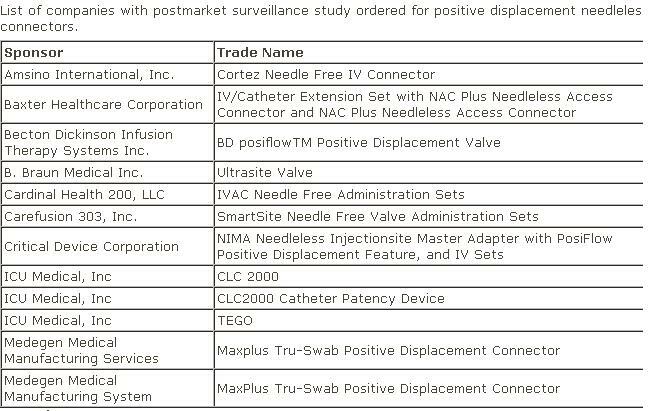 Because there is presently insufficient information to determine if positive displacement connectors increase the risk of BSI compared with other needleless connectors, FDA is requiring 9 companies to conduct postmarket surveillance studies to provide an assessment of the risk associated with positive displacement needleless connectors. At this time, FDA is not recommending changes in use of positive displacement needleless connectors. Healthcare professionals are encouraged to follow their organization’s practice recommendations for prevention of health-care associated infections. For more information about this alert, click here. I have used the “microclave” which is also neutral displacement but haven’t used the new product described in your link. Thanks for your comment. there is only one neutral connector out there and it is by a company called rymed. other companies claim neutral but they have reflux of blood on either connection or disconnectin which does not make them neutral and because they have reflux they have an environment to grow bacteria. Micro clave per research presented at SHEA grows 4 types of bacteria and we donot use it. hope this helps. There is more to being zero fluid displacement than calling yourself neutral. ICU in the fine print says virtually neutral. No fluid movement is due to no dead space. Microclave actually has more reflux than the Clave. Both have deadspace. Jarvis in August Infection Control lists design features linked to success. Microclave does not have septum seal integrity which minimizes microbial ingress and assures successful swabbing. The problem with connectors is it is a more complex than just nomenclature. Hi Denise, thanks for the comment.